As predicted, this week has been crazy with my kids out on spring break. We've been out and about, and when we're not, it's still crazy around here. My 6 year old says "he's bored" if he's not doing something practically every minute. Not looking forward to this summer with them now that they ALWAYS want to be on the go or entertained. Funnily enough, the are not content to just sit and watch T.V. I suppose it's a good thing though. Anyhoo, I set four goals for the month of March, and did pretty well with them. On the weight loss front, I'd like to lose at least 6 pounds. This is a very attainable goal. And it fits with the experts recommendations of losing 1-2 pounds per week. On February 29th I was 194.8, and on March 28th I was 189.4- for a total loss of 5.4 pounds for the month. Didn't hit it, but close enough! 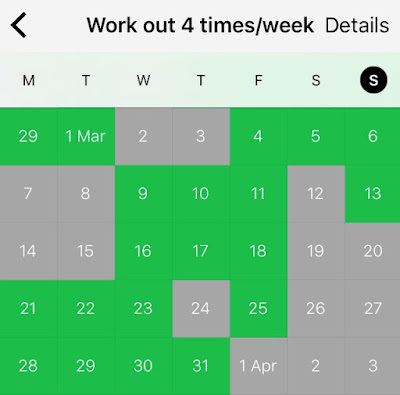 With working out, I'd like to get in at least 4 workouts per week. Any combo of walking or biking or dancing. I haven't done the Just Dance in a while now that I think about it. I worked out 4 times in 3 out of 4 weeks, and the 4th week, I worked out 3 times. In order to get better sleep, I would like to get 7.5 hours average sleep for the week. My fitbit gives me averages for the week. The past two weeks, I've gotten 7 hr, 27 mins and 7 hr, 46 mins respectively. Plus, the science is clear that you feel better and lose weight when you get enough sleep. This actually didn't go as well as it should have. I have got to start getting more sleep. To keep up with my new year's resolution, I need to read two books this month. I just finished The Racketeer by John Grisham, and I'm now reading Gone Girl by Gillian Flynn. I finished up Gone Girl and read Gray Mountain by John Grisham. For April, my goals will be the same, plus I will like to add in a few house projects. I'll be redecorating my living room, and I want to do some things in the kitchen as well. Spring is here, and I want some fresh beginnings in this house. So while I'm "spring cleaning" and swapping out clothes and organizing, I may as well do some things I've been wanting to do. My 3 month doctor's visit is tomorrow. It was the last visit on January 4th that I was hit with the health problems that spurred me to do the diet changes. I hope I don't get hit with white coat syndrome and my blood pressure is good. I'll also be getting new blood work done to check on my cholesterol. I hope that's good also and I don't have to start meds for it. *Fingers crossed. * Regardless though, I'm sure my doctor should be impressed with the fact that I took her advice and am getting healthier.